Just like picking the best webinar platform, deciding which webinars to create can seem overwhelming at first. Your platform will have all kinds of functionality and ways you can format a broadcast, so how do you know which types of webinar to run and when? It comes down to what you want to achieve and the kind of interaction you want with your audience. Here are four examples of webinars you can set up and deliver, and when you might want to give each a go. Both B2B and B2C consumers count on online reviews and conversation when it comes to purchasing products. Showcasing yours in a webinar is a great way to provide useful details, inform purchasing decisions and gain a level of control over what’s being said about your products or services. You can show off USPs, anticipate and answer tricky questions, and put a friendly face in front of the camera who leads can relate to. 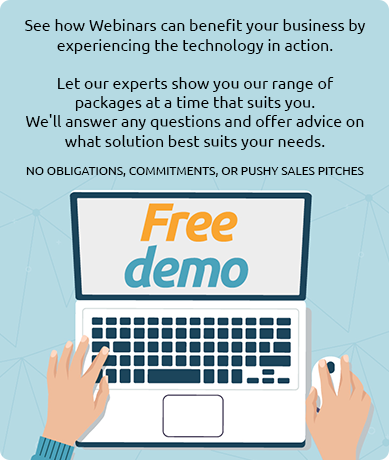 The launch of a new product is the ideal time to run a product demo webinar; weave it into your overall campaign launch content. Webinars are one of the best forms of content to position yourself as an influencer or serious player in your industry. They present the opportunity to share your message with a large number of attendees, for your ideas to be challenged, and to prove yourself and gain respect. There is a catch: this will only work if you are genuinely offering a unique, forward-thinking and valuable insight. For this reason, only consider running a thought leadership webinar when you are certain you have a well-researched point to make that will spark interest among your audience. Join forces with respected industry peers for a co-marketing webinar to up your credibility even further. Most people are open to sharpening their knowledge, and training webinars hook attendees in through the promise of learning something new. Webinars are a nice set-up for educational presentations: just like in a classroom, you can have a presentation playing, talk along to the slides and answer questions in real-time. Plan these for customer on-boarding, new feature releases, or advice based around your products and services. Once you start to run these, you’ll find viewers will request more and give you inspiration for future topics. A question and answer section is pretty standard with most webinars, but have you thought about making your entire broadcast a Q&A? Invite attendees to ask you anything (maybe have someone moderating questions as they come in, to keep things PG!) and pick a presenter who knows your brand inside out. Of all the types of webinar mentioned here, this is the most effective if you want get to know your customers and build trust with them. Their questions reflect exactly what they want from you and provide direct feedback that you can use to perfect your services. Meanwhile, your answers give them confidence in you as well as useful information. Which of these webinar formats will you tackle first? Drop us a message on Facebook or Twitter if you would like a chat about making them work, or hit up our Knowledge Bank for more general webcasting advice.